This is a picture I took of Skogafoss, a waterfall in the south of Iceland which is some 200 feet (60m) in height and 82 feet (25m) across. You can just see the tiny figure of a friend of mine who braved the spray to take a closer look. On such a cold day, I was quite happy to keep a certain distance. 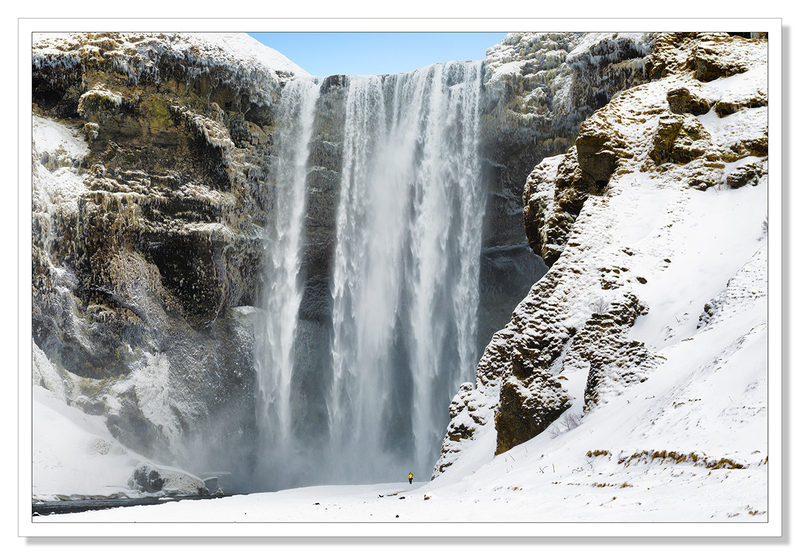 An iconic waterfall and a guaranteed stop on any Golden Circle Tour, Skogafoss is worthy of the attention it receives. The water cascades over what was once a clifftop but as the sea receded, the coastline is now just over three miles away, the cliffs remained. Due to the amount of spray the waterfall consistently produces, a single or double rainbow is normally visible on sunny days. According to legend, the first Viking settler in the area, Þrasi Þórólfsson, buried a treasure in a cave behind the waterfall. The legend continues that locals found the chest years later, but were only able to grasp the ring on the side of the chest before it disappeared again. The ring was allegedly given to the local church. The old church door ring is now in a museum, though whether it gives any credence to the folklore is debatable. This entry was posted on June 22, 2015 by Chillbrook. It was filed under Photography, Photography and Travel and was tagged with Adrian Theze, Cornwall Photographic, Iceland, Landscape Photography, Nikon D800e, Photography, Skogafoss, Waterfall, Winter. Very impressive, Chillbrook. And your friend plays a very important part in this picture. Iceland’s waterfalls are indeed impressive Shimon. This one especially as you can walk right to the foot of the falls, as my friend did, giving me the photograph. Wow, great shot and lovely legend! I’m guessing it was an early start for this freezing shot ChillB, Skogafoss really is a magnificent mesmerising sight ! Great shots. This is fascinating and very interesting. Lovely shot and the well-positioned, yellow-jacketed human for scale made me smile. [Sigh…] you don’t find waterfalls like this in Cornwall. Looks like someone has been here and scattered icing-sugar all over those rocks. How beautiful! You never see many snowy pictures of waterfalls. Wish I could hang it on my wall right now. It’s hot as Hel* here. That tiny speck of humanity is crucial to understanding the scale of this fall. That speck does put things in perspective Andy that’s for sure. These falls are really quite something! Best wishes to you. Hope you are staying warm and dry! The size of your friend really adds perspective – what a monster! Enjoyed your recital of the legend too. Great shot Adrian……and the image wouldn’t be the same if it weren’t for the figure, because you wouldn’t appreciate the scale otherwise. This is one utterly amazing shot, Adrian. I agree it wouldn’t be quite the same without the human for that sense of scale. It’s really fun to compare this photo with the next. So different, both the obvious seasonal change as well as the whole mood. That little guy in the lower corner puts everything in perspective.